A baby brings great joy to a new father, but also, perhaps, some uncertainty. For many men, fatherhood may seem like a new job for which they have had no training or experience. In these pages, pediatricians, and fathers, Robert and James Sears offer reassuring, timeless advice to help new dads prepare for and embrace their important role. In an encouraging and light-hearted tone they highlight 25 important facets of becoming a dad and emphasize the rewards and pure joy that come with parenthood. This inspiring read is the perfect gift for any new or expectant father! 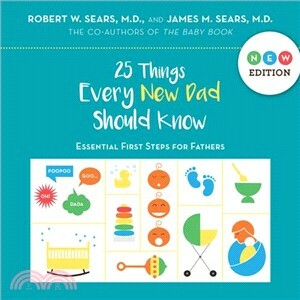 Robert and James Sears, both pediatricians and fathers themselves, are two of the sons of William and Martha Sears, creators of the Sears Parenting Library. Although William and Martha created the series, the four-person team of William, Martha, James, and Robert has authored all editions since the mid-2000s. Robert and James Sears live in the San Diego area.